When you want your nails to take center stage, a bold-looking design can add interest and intrigue to your style. Graphic black and white airbrushed swirls have a hint of retro flair but still look fresh and modern. The black and white contrast makes an eye-catching design. Lively touches of gold catch the light and create an exotic, adventurous look in a manicure. Pair gold floral nail art with rich colors like plum, violet, and coral for even more flair. A pretty design inspired by plaid adorns these nails. The straight lines and multiple colors are sharp and creative. When considering a multi-colored design like this, keep your outfit simple to allow your nails to shine. A simple way to create an adventurous nail design is to do use a bright base polish, such as red, and paint the tips a sophisticated black. Add freehand patterns or flowers, also in black, on one or two accent nails to add more interest to the look. Add a dose of drama to a pink background with butterflies and fairies done in dark outlines. The eyes are drawn to the beautiful nail art because of the contrast to the light background. A nail design like this is the perfect companion to a simple feminine dress. The beauty of nature offers plenty of inspiration for lovely, beautiful nails. This design showcases gorgeous greenery. The clear base really allows the design to pop and intricate details to show. Choose an unexpected color such as blue or turquoise as the background for a dynamic floral design. Pointed petals and dark greenery create a vibrant and unique look. Nail designs don't have to be complicated or intricate to be stunning. Simple stripes in two or three shades offer a contemporary look. An added bonus is that this design is fairly easy to achieve at home; a steady head and nail art pens are all you need. One of the most popular ways to create a simple yet standout nail style is to use one or two nails as your canvas for accent designs. Here the soft pink of the nails is contrasted by the modern black accent nail. A French manicure is classically lovely, and the ways to modernize and dress up this nail style are endless. 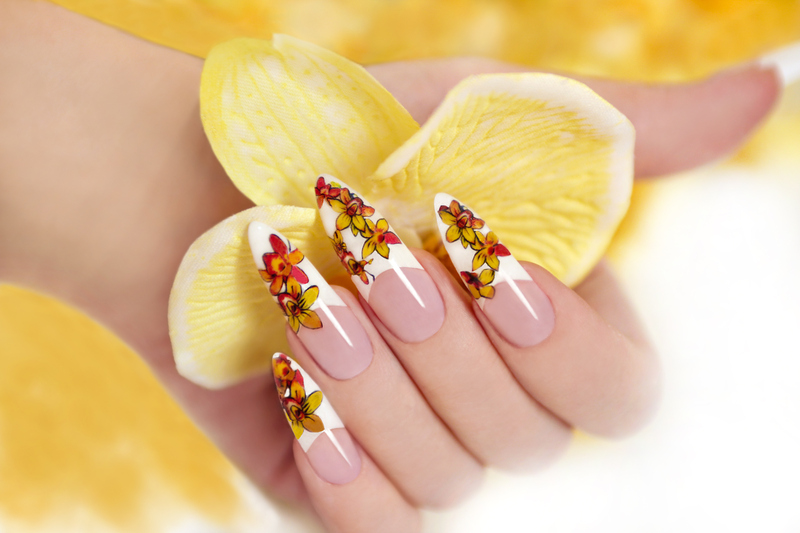 A floral design that extends slightly past the nail tip is an interesting choice. Choose the design in colors that coordinate with some of your favorite clothing items for a pulled-together look. Multiple colors and soft edges contrast beautifully with the fresh black background of this dreamy, impressionistic, water-color-inspired design. If you're attempting a look like this at home, use a light hand to prevent polish from overloading the nail. Another unique nail idea is to use contrasting elements in your nail design. The bright red tips in this design, for example, contrast sharply with the delicate flowers and glittering crystal embellishments. The result is a look that is at once powerful and feminine. Like a mini canvas, your nails allow you to really express yourself, and nail art design ideas are truly limitless. Simple looks like stripes are perfect for every day, while more complex designs are prime choices for special occasions.